I think I've survived. Just! My wine consumption may have increased ever so slightly (mmmm a lot!). My chocolate consumption has been insane. All in the name of helping eat the stash so the kids don't have too much. But seriously we have had a blast. Lots of lazy days, with various appointments, catch ups with friends and different activities in between. I'm loving that tasty, healthy dinners are on the table every night. That both my owlets have embraced their chores with gusto (no seriously they are totally into it). As a whole our little house is happy and less stressed. Ahhhh and back to work next week. I'm very lucky with my job to be able to take almost all school holidays off (thanks mum for covering one!). I think they are perfectly timed to give us all a break. I thought I would share one thing my son loves (particularly on these rainy, cold days). 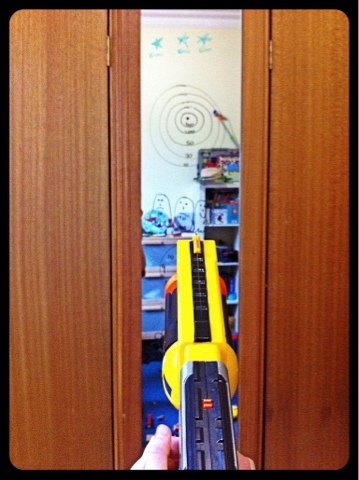 We draw targets on the mirror in his room and assign values (he he he secret maths work!). He loves Nerf and this is a great Way to focus his skill at shooting a mirror, rather than his sister. Mood board? Inspiration? New directions?